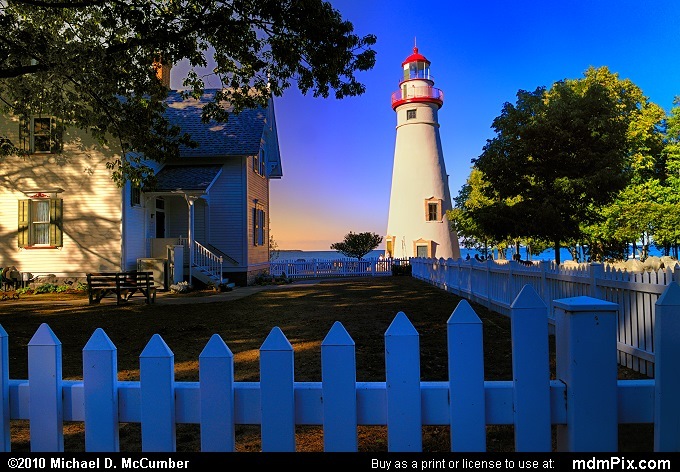 Pictured is one of Ohio's most photogenic of Lake Erie Lights -- the fifty foot tall Marblehead Lighthouse that is featured in the distance with a shaded white picket fence in the foreground and the light keeper's house that is now a museum. The lighthouse grounds are now an Ohio state park comprising of only 9 acres. Cedar Point Amusement Park can be seen across the bay along with some several islands from the state park's shoreline.